We at Bush Tyres recognise the fact that the brakes are one of the most important safety features on your vehicle. It is vital that brakes are checked regularly as they become much less effective with age, and poor brakes can dramatically impair vehicle handling and tyre wear. We recommend your car is checked at least every 15,000 miles to protect your safety and your pocket. Our staff are trained and fully equipped to test brakes and at Bush Tyres we can offer a FREE, no obligation inspection of your vehicle! We also offer a complete range of replacement discs or drum brakes for your vehicle. What's more, all our brakes come with a full guarantee! Where are brakes located on a car? The wheels on the car are where the disc brake or drum brakes are located but these are connected to other parts of the car. The foot brake pedal is joined to the hydraulic system that applies the brake pads or drum brakes on the 4 wheels. You also have a hand brake that, when used, causes the rear brakes to gently be applied. This is not part of the hydraulic braking system. Which brakes are more important? All the brakes on your car are important, however, the ones that are applied via the foot brake are the brakes that will slow you down quicker and help you to avoid accidents. As well as being used when parking, the handbrake is a backup brake if you have problems with your hydraulic brake system. It should be used with care though as when used at high speeds, it can cause you to lose control. Which brakes stop the car? The hydraulic braking system is what will generally help you to stop the car when it is moving. The foot brake applies the brakes on all wheels that are linked to the hydraulic system and is the safest and most effective way of stopping the vehicle. 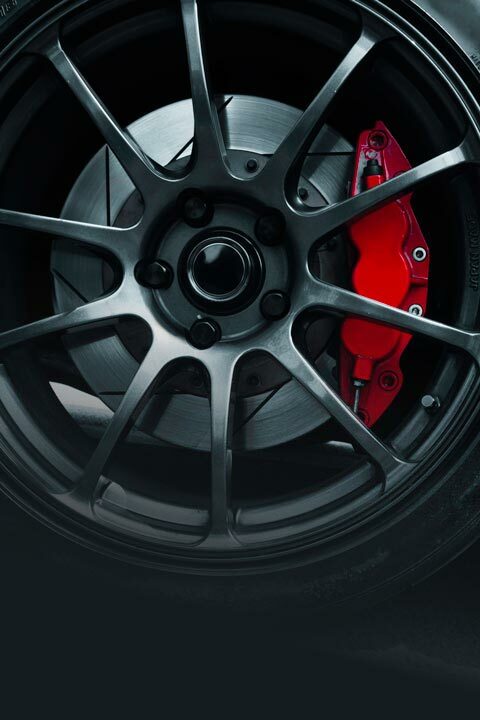 Some cars have disc brakes on all 4 wheels while others may have drum brakes fitted to the rear wheels. Why brakes squeak when new? Despite what you may have heard, brakes shouldn't squeak, not even when new. A squeaky brake indicates an issue. With new brakes, this may be that the brake pad was changed but the rotors were not replaced with them. If this is the case, the rotors should be cleaned if not being replaced. Another possible reason is that the metal on the back of the brake pad is vibrating against the mounts. Some brakes come with anti-squeak shims so this could be the issue if your brakes didn't have them. Brakes become less effective as they age. As brakes use a hydraulic system, there needs to be fluid in the hydraulic pipes for them to work correctly. When fluid leaks from the pipes, your brakes will start to fail. You can feel this is happening when pressing the brake pedal when you are stationary - the brake will feel much softer than usual. A correctly working brake should give some resistance when pressed. If brakes lock up, it is usually due to the brakes being applied too hard. If the brake is applied hard, the wheel is unable to resist the friction and therefore the wheel stops turning. This also stops you from being able to control the direction that the car is travelling as you have no steering control. This can be alleviated by coming off the brake as this will allow your tyres to regain traction on the road before re-applying the brake more gently. Another reason that brakes lock up is that there is an issue with the brake pads, callipers (disc brakes), wheel bearings or cylinders (drum brakes). Are brakes on all 4 wheels? Modern cars usually have brakes on all 4 wheels but some have different types of brakes on front and back. For example, some may have disc brakes on all four wheels, while others may have drum brakes on the back wheels.